The article that appears on the right was published in a news digest magazine two weeks after Stalin had assumed room temperature. Stalin's true legacy (ordering the murder of 20,000,000 people) would not be widely known for another year and so these three pages simply depicted him as a one of the more tyrannical dictators to govern Russia; one who consolidated power while choosing the expansion of industry over the liberties of the citizenry. "Lenin used severe methods only in the most necessary cases, when the exploiting classes were still in existence and were vigorously opposing the revolution, when the struggle for survival was decidedly assuming the sharpest forms, even including a civil war." "Stalin, on the other hand, used extreme methods and mass repressions at a time when the revolution was already victorious, when the Soviet state was strengthened, when the exploiting classes were already liquidated, and Socialist relations were rooted solidly in all phases of national economy, when our party was politically consolidated and had strengthened itself both numerically and ideologically. It is clear that here Stalin showed in a whole series of cases his intolerance, his brutality, and his abuse of power. Instead of proving his political correctness and mobilizing the masses, he often chose the path of repression and physical annihilation, not only against actual enemies, but also against individuals who had not committed any crimes against the party and the Soviet Government. 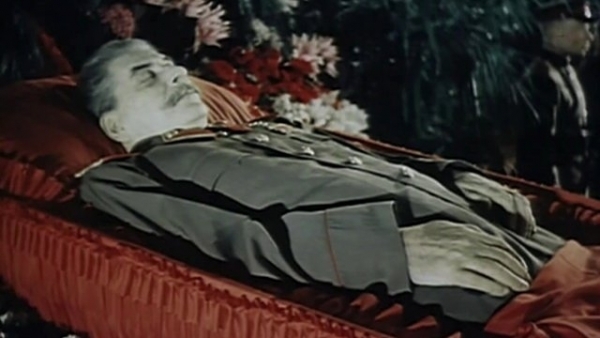 Here we see no wisdom but only a demonstration of the brutal force which had once so alarmed V.I Lenin. . . ."
Click here to read another article about the 1953 death of Stalin.